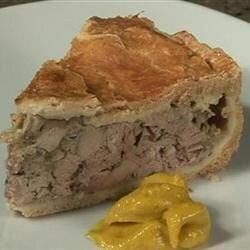 "Pork Pie is a standard Christmas Eve or New Year's Eve treat in my predominantly French-Canadian hometown in Maine. It's served with catsup or mustard, tossed salad, and pickles. Simple but wonderful. Top individual servings with catsup or mustard before serving." See what happens when German schnitzel technology meets Southern country cooking. The pork pies were quite amazing!!!!! This Pork Pie was very good with mashed potatoes in the mix rather than bread crumbs as in other recipes. Found the meat could have had some chopped onion and some more spices though. This is the second Christmas now that I decided to make this pie! So, it is REALLY good! People loved it! Hope they will do so this time, too. :-)) Thanks, Laurie! I thought this was a good and unique dish. But, I have to admit that it is just one of those dishes I will probably never make again.